The Safco Mobile Beverage Cart Refreshment Stand has a contemporary appeal and utilitarian design which is perfect for any space. 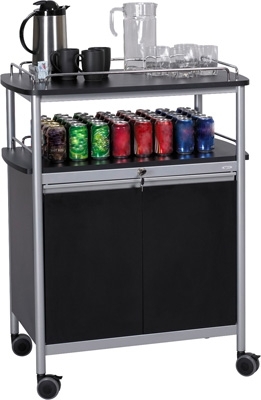 A sleek modern rolling refreshment cart is suitable for use in lobbies, conference rooms or board rooms. It's sturdy melamine top has 1-1/2"H wire rails to prevent items from falling off in transport. Spacious, locking cabinet has one adjustable 29"W x 16-1/2"D steel shelf. Open storage area is 8-3/4" high. Mobile on 3-1/2" casters (2 locking).